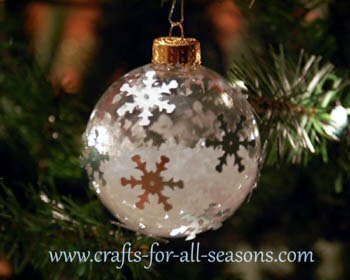 This snowflake ornament is a beautiful decoration for any Christmas tree. This craft is easy enough for children to do, and makes a great school Christmas craft. The clear ball is filled with imitation snow and then the outside is decorated with snowflake sequins. 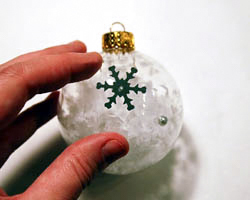 Clear ball ornaments can be found in craft stores and in the dollar stores around the holidays. These can be decorated in many different ways. 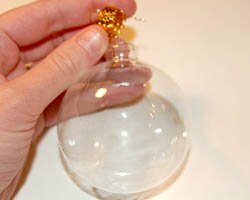 If you would like to see other ways to decorate clear glass ball ornaments, check out these pages too: tinsel ornament, paint swirled ornament, and sparkling gem ornament. 1. Begin the ornament by removing the top covering to the ornament and set it aside. 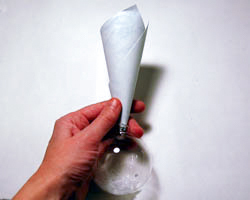 Next, make a little funnel out of rolled up piece of paper. Place this inside the opening to the ornament, then feed some snow through the funnel. Use a pencil to help push it through. Fill it up at least half way with snow. 2. Put the ornament top back on. Using the glitter glue, paint dots all over the ornament. 3. 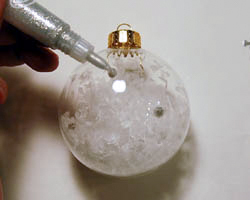 Next place a snowflake sequin on each drop of glue, and allow the ornament to dry well. This is now ready to hang on the tree.